Marshmallows to break into pieces, put in blender, add cream. Shake thoroughly until a homogeneous mass. Strawberries cut into quarters (if large, then cut them smaller). Kiwi cleaned, cut into cubes. In a ramekin or Cup to put the strawberries in a single layer. Pour over the cream to completely cover the strawberries. 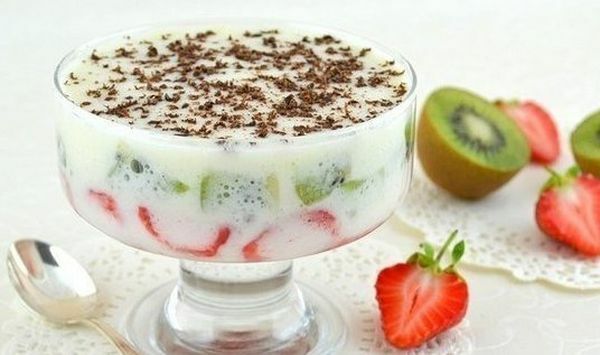 Arrange kiwi fruit in a single layer. Pour the cream cranberry kiwi. Dessert you can serve immediately, but you can put an hour in the fridge to cool. Will be delicious in any case.